The 2007 Grain SA Developing Farmer of the Year, Lepati Macaphasa, sadly passed away in August 2015. Fortunately Lepati had a succession plan in place as he thoroughly realised the importance of preparing his successors with the necessary farming knowledge and skills. Thabo and Motlalepula, his two sons, joined their father in 1994 to learn the ropes of his farming operation. Later on they did most of the farming, which has made it easier for them to continue after his death. Preparations for the season’s cropping had already begun when he passed away and much of the financing was already obtained. Although some of the finances have been ‘frozen’ they are capable of carrying on as the knowledge and skills their father taught them cannot be ‘frozen’. Their farming operation – which is situated between Kestell and Phuthaditjhaba – is a mixed operation with Bonsmaras, sheep and crops. It comprises approximately 450 hectares, of which 123 hectares is arable land and the rest suitable for grazing. The two brothers have already planted about 50 hectares of soybeans. There is also a prepared area of 29 hectares where maize will be planted. Financing and drought conditions will determine what action will be taken on the rest of the land. Both Thabo and Motlalepula are very proud of what their father achieved in his lifetime and place huge value on the skills and knowledge he invested in them. They would love to follow in his footsteps and receive recognition one day, but at this stage their main focus is on drought survival. ‘The farming work is easy. It is what we have always been doing. The unpredictable climate is what makes farming difficult,’ Thabo says and adds, ‘Funding is often a problem, but it was this way when our father was alive too.’ Lepati left them well set up with equipment, tools as well as the necessary skills and knowledge to continue his farming operation. He always expected them to do the work and made sure they worked very hard, but he allowed them to make mistakes as long as they learned from it. They do not find it difficult to work together on the farm as each does whatever needs to be done. Both their wives are also actively involved in the business. According to their brothers, their sisters, Sarah Modiehi and Nthabiseng Agnes, also know how to farm and work hard. Although not directly involved in the farming, they assist seasonally and when required – usually at planting and harvesting. Unlike their father, the two brothers are not involved in organised agriculture at this stage. ‘Previously there were more advantages to be organised as farmers as there was more assistance. Farmers are now left to fend for themselves,’ Thabo explains. They agree that their father obtained valuable knowledge and skills through assistance from organisations such as Grain SA. Although they have never been involved in any study groups of Grain SA they would like to join especially if it means improving knowledge and gaining skills. Thabo and Motlalepula are worried about the future of agriculture in South Africa. They feel it is not seen as an important point to the government and as a result of this lack of support from government a massive need for food production will arise. Another concern is that it seems to them that the young/new farmers do not want to work very hard. If they aren’t prepared to invest time into their trade, it will lead to a lack of the necessary skills and knowledge to continue with a farming operation. Wilbur Wright, one of the fathers of modern aviation, said: ‘It is possible to fly without motors, but not without knowledge and skills.’ With the knowledge and skills invested in the Macaphasa family we trust that their farming enterprise will reach new heights. 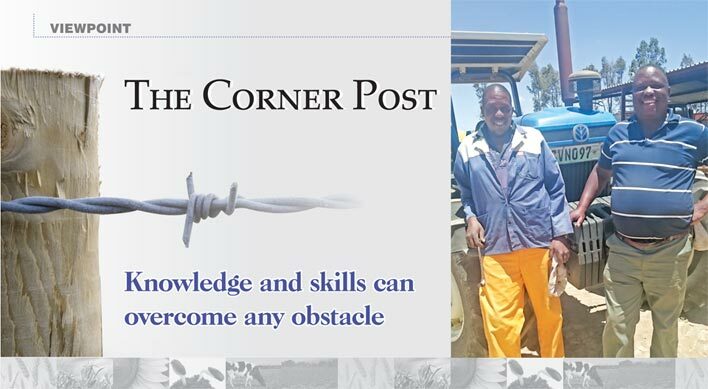 This month's edition of The Corner Post was written by Louise Kunz, Pula Imvula contributor in collaboration with Graeme Engelbrecht, Grain SA Provincial Coordinator, Louwsburg, KwaZulu-Natal. For more information, send an email to louise@infoworks.biz.